Summary: Poet Nikki Grimes combines her own works with those of various poets from the Harlem Renaissance. She uses the “Golden Shovel” method, in which she takes a line from another poet’s work, and uses each word from that line as the final word in every line of her own poem. Her works focus on kids, particularly those of color, and have inspirational messages about hard work, hope, and being yourself. 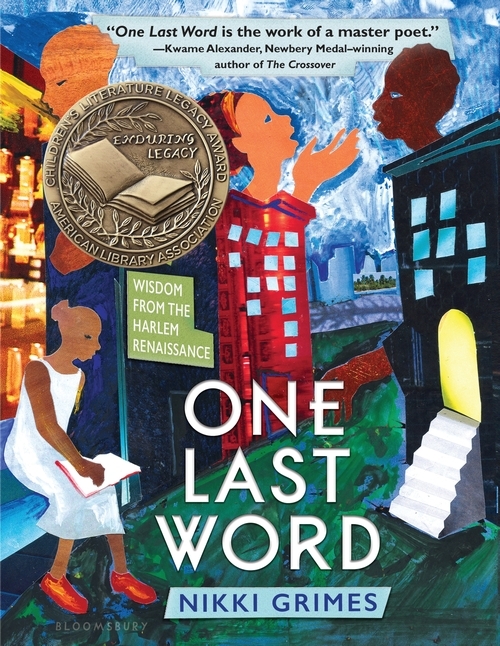 The poems are illustrated by a variety of artists, including many children’s book illustrators such as Christopher Myers, Sean Qualls, and Javaka Steptoe. An introduction gives a brief history of the Harlem Renaissance; back matter includes biographies of the poets and artists, sources, and an index. 128 pages; grades 5-9. Pros: Nikki Grimes was just given the Laura Ingalls Wilder award for making a lasting contribution to children’s literature, and this book continues in that vein. Her own poetry is beautiful and inspiring, and placing it side-by-side with the Harlem Renaissance poets adds historical depth and richness. The beautiful artwork completes the poetry. Cons: Additional resources to learn more about the Harlem Renaissance would have been useful.